I awoke to the sound of rain pitter pattering on the roof of the caravan. It was pitch dark, and according to my watch it was still the middle of the night – so much for a good night’s sleep after my long drive. I also could feel it was cold. Really cold. I’m a light sleeper so it doesn’t take much to wake me up at the best of times, but here there were lots of new sounds: A creaking caravan, the rain on the roof and the rustle of the leaves in the tree above us. There was movement nearby – it was Martyna’s sister Kasia and her boyfriend Daniel who had to drive back to Vienna today, and were leaving at the crack of dawn. I heard their car leave, and then fell asleep again to the first sounds of the morning chorus. Sometime later I rolled over in bed (somewhat constrained by the several layers of clothing I had on inside my sleeping bag), and opening my eyes briefly I could see it was light. It was still early, but from somewhere I could hear dogs barking, the unmistakeable sound of children playing and people speaking in Polish. 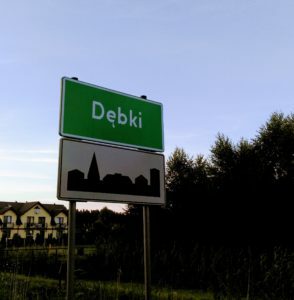 I had woken up in Debki. My girlfriend Martyna was still sleeping, but I was filled with the excitement of a new place and country to explore. I therefore got dressed into my running gear and headed off in the direction of the beach. It took about ten minutes to get there running on the gravel track, which after a while turned into a sandy path through a forest and sand-dunes. All of a sudden the trees ended and I was looking out upon a vast stretch of pure white sand, lapped by a deep blue sea and foaming waves. First impressions count with beaches, and this one had the wow factor in abundance. The river I’d been following meandered across the sand forming a lagoon and then into the sea. I was going to enjoy it here. I jogged quickly back to the family “działka” (literally, plot), and found everyone now up and preparing for breakfast. In the daylight, I could see their plot was one of about 8-10 clustered together along the track I had found (almost by accident) last night. Martyna’s bubbly sister Julia was up and about, and Ela and Jacek her parents were busily making breakfast for everyone. I quickly saw that breakfast in Poland was a serious activity: There were mountains of delicious looking varied bread rolls, pots of home-made jam, plates of sliced cheeses, meats and sausage, and then sliced tomato, cucumber, orange juice, tea, coffee. The list went on. Ela announced that she was proud to offer an “all inclusive” camping experience here in Debki! I had met Julia a few times before and knew that Polish people could be talkative, but hearing for the first time family conversations I could see that conversing in Polish was an art-form. Every word and sentence was delivered in a passionate and expressive way. The loudness of delivery and facial expressions seemed to fluctuate with the level of agreement in the conversation as well. As the tempo escalated it seemed to this reserved Englishman like the start of a major family row, and I almost disappeared in case it all kicked-off. I quickly realised though this is just how it sounds – Polish conversation is “animated” shall we say. Polish people are passionate, and fiercely protective of their language and culture. This passion manifests itself clearly in the conversations you’ll hear in Poland! This time I had the chance to take in the surroundings a bit more. The gravel track we were walking down was kind of a “back-route” to the beach. What back-route meant to many drivers here was “racetrack”. There was a correlation between how fast a car drove past and how old it was (and therefore how little the driver cared about his paintwork and suspension being wrecked). We made it to the end of the track without being mown down, and came across the start of the beach related businesses. The businesses were selling just about anything you could think of, and were all operating out of either a shed, a tent, or simply a table placed by the road. The bakers was in an odd kind of plastic greenhouse type structure – this seemed however very sensible as everything was visible, but without the kids being able to stick their fingers in the buns! As we came to the beach Martyna pointed out to me a stone monument by the mouth of the Piasnica river – this was “Border Post Number 1“, marking the seaward end of the German-Polish border during the interwar period. This was incredible to a British person, unused as we are to changing borders. But here is was a reality – the border today lies several hundred kilometres to the West and shows how much Europe has changed in the past 100 years due to war. The beach here really is something special. Unlike almost everywhere on the Mediterranean where the buildings and high-rises go right up to the beach, here there was only protected state forest for miles in both directions. This meant the beach had a wild and untouched feeling to it, despite the large number of people there. Another difference to Mediterranean beaches was the temperature. Although the sun was out the wind was, shall we say “fresh”. As a result, the first task was to erect our windbreak (or “Parawan”in Polish) fortress which I was tasked with. I built what I considered a defensive masterwork, filling in all available gaps under the windbreak with sand mounds, and the girls seemed pretty happy. It was fun, and took me back to childhoods on the West Wales coast. Many people seemed to be going for a kind of Beach Business Class approach, with a number of small pop-up tents visible in addition to the windbreaks and picnic blankets. Unfortunately many of the men on the beach hadn’t, and when a few started playing beach tennis in front of us there was rather too much in the way of ball movement on display. To clear my head, I decided a dip in the inviting ocean was in order. I was expecting it to be cold, and it didn’t let me down. But it did remove the portly men in speedos vision from my memory which was a good thing. The other side of the rustic beach experience was that there were only chemical toilets available. And not that many. There is a skill developed by regular visitors to Debki, and this is an ability to hold one’s breath for minutes on end in order to use one of these toilets. Still, for anyone who’s been to a UK festival you’ll be fine…it’s nowhere near as bad…! Back at the camp, Jacek was pleased to have someone else to help with the never-ending task of wood-cutting and fire-starting (and water-pumping). Dinner was meat grilled over the fire, with assorted pickles and potatoes on the side. This was wonderful, simple food as it should be, and I have to say the quality of the Polish meats and vegetables was much higher than would normally be found in Germany. We ate dinner together sat around the fire, washed down with some excellent Polish beer. Continuing the trend set the previous night as I’d arrived, during dinner more people emerged from the trees, often adding food to the table or bringing additional meat to grill. All of them had alcohol of one sort or another with them, and one or two a child, baby or dog in tow as well. The feeling of community here was wonderful and warm. Even though I don’t speak any Polish, I could clearly pick-up that the ladies were gossiping about others from the neighbouring działka. Some things never change….! This was the first time Martyna and I had seen each other for a while, so wanting a bit of time for ourselves we wandered into the village. The village centre was pure summer holiday town – it was clear that 95% of the village existed purely to service visitors in the short summer season. The main street Ulica Spacerowa (literally, “Walking Street”) backed right up against the forest, and on one side was a row of wood built shops, restaurants, kiosks, amusement arcades, and on the other just visible through the trees were an amazing variety of summer houses. Most had their own private area of forest, and some looked extremely large and luxurious whilst others were older and more rustic. All however had a very distinctive design – kind of a twist on Alpine/Nordic. 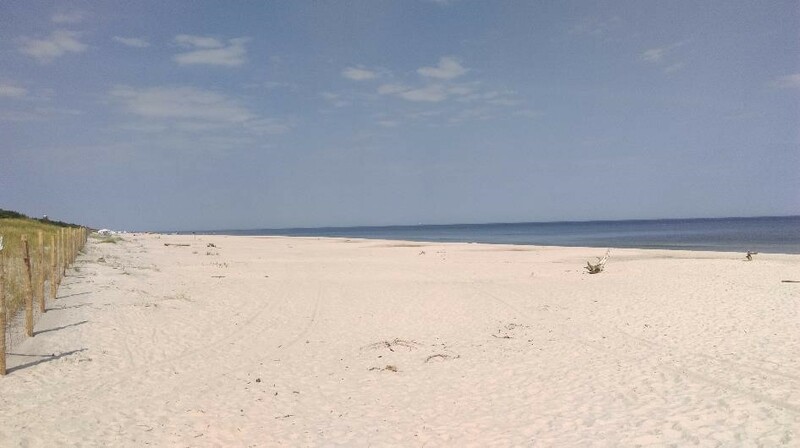 The village was busy since it was high-season, and after picking up a Lody (ice-cream), we made our way to the beach (or “Plaża”). Every few hundred metres there was a path leading from the road through the forest to the beach. These were all numbered, and were known as “Wejście” – meaning entrance. We used entrance 23 which was one of the busier ones (and also had some lighting), and after a few minutes arrived at the beach just as the sun was setting. 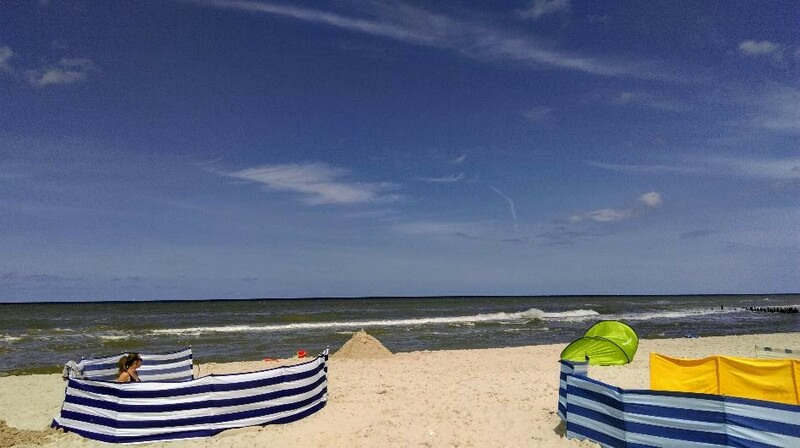 This section of the beach was more setup for tourists than others – there was childrens play equipment, beach equipment for hire, and also a large bar – the Kontener Debki. The Kontener bar was (you can probably guess this) made of Container type units so it could be built in the spring and packed up at Autumn. This left the beach untouched the remainder of the year. We went upstairs and enjoyed a couple of cocktails. Downstairs a DJ was playing – this was clearly one of the party spots of the town, and beyond the bar on the beach sat scattered groups of youngsters. 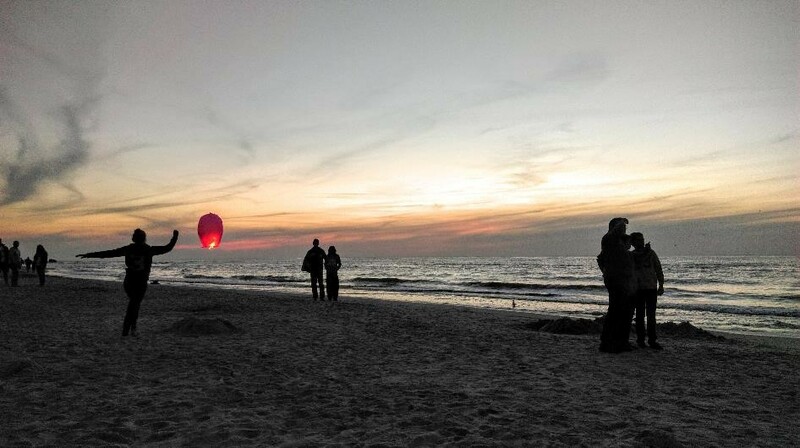 The vistas were long, and the cool air and beautiful sky made for a wonderful evening here on the beach in Poland. Time to head home from Poland…. As I had my bike with me, I used the opportunity to see a bit more of the area after waking up on Sunday. I headed back through the village which was starting to wake up (the bakeries were fronted with long queues), and then out the other side. I kept going for about 10 minutes and then picked a hard enough looking track to cut through the forest. 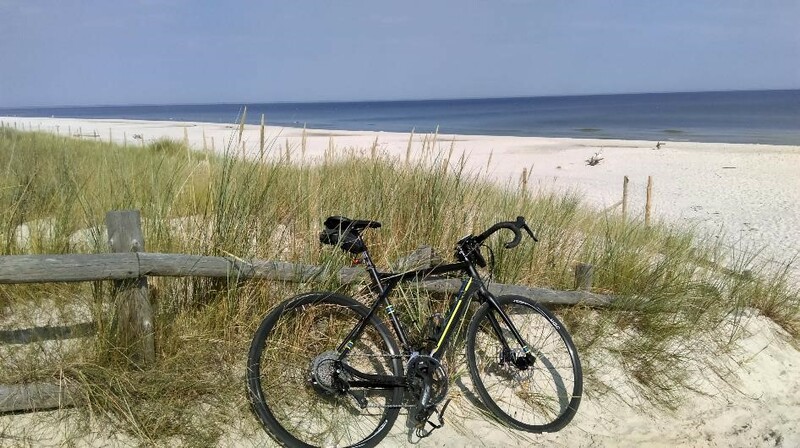 It was wonderful riding on the forest track, and only in the last few metres before the beach when the forest floor transitioned to sand did I need to get off and push. I’d come to a deserted stretch of beach, and the early Sunday morning sunshine and deep blue sky could not have been bettered. I was gutted to leave this scenery and head home. It had been a whirlwind first trip to Poland. I’d met Martyna’s family and also many of the neighbours in Debki, and all had been so kind and welcoming. I’d seen that food in Poland was hearty, wholesome and delicious, and I learned also that a meal in Poland should always be accompanied by a good discussion (or to an outsider, argument). 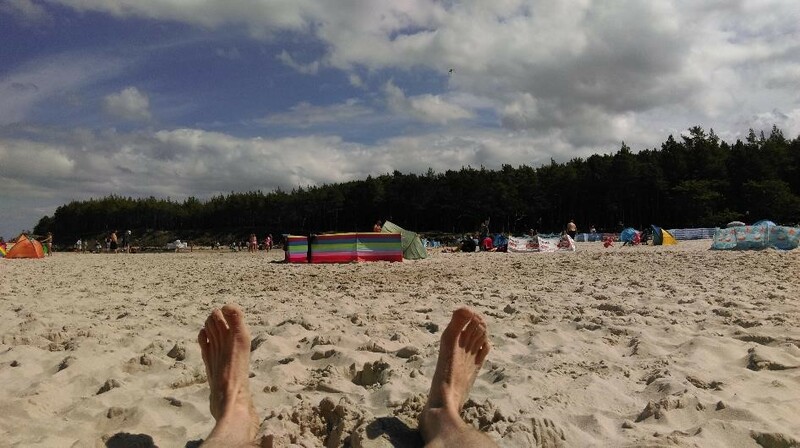 The Baltic coast of Poland was beautiful, yet according to what I’d seen Debki was frequented almost exclusively by Polish visitors. Does it deserve to be better known? Absolutely, because the landscape, culture, people and cuisine are in some ways familiar, yet in a resolutely Polish way were proud and different. I was leaving today but I knew I would be back, and I was also looking forward to exploring more of Poland with Martyna. For now, I set-off in my car with wonderful memories of my first immersion in Polish culture.